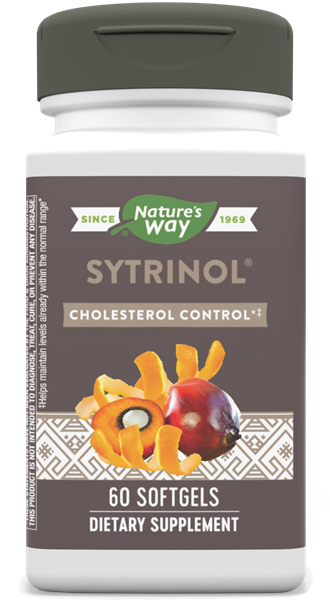 Sytrinol / 60 Softgels - Nature's Way®. Sytrinol® is a unique blend of bioflavonoids (polymethoxylated flavones) and tocotrienols extracted from citrus and palm fruits. Take 1 softgel twice daily, or as recommended by a healthcare professional. Caution: Do not use this product if you are pregnant, nursing or trying to conceive. If you are taking any medications, consult a healthcare professional before use. ‡‡Sytrinol® is a registered trademark of InterHealth N.I. ‡‡‡Sytrinol® branded blend of citrus and palm fruit extracts (U.S. Patents 6,987,125 and 7,683,095).